That means things are going to change. "China sees itself less as slotting into some global financial system and more that it’s going to create its own system and shape the global financial markets," Keyu Jin, an associate professor of economics at the London School of Economics, tells Axios on the sidelines of the IMF-World Bank meetings. The big picture: Last week Chinese yuan-denominated bonds entered the Bloomberg Barclays aggregate bond index, and global index maker MSCI in February quadrupled its indexes' exposure to China's onshore A share stocks. Venezuela's oil production fell 500,000 barrels per day in March from the previous month, the country reported yesterday. Despite being home to the world's largest proven oil reserves, Venezuela now pumps around 1/10th of OPEC leader Saudi Arabia's output, and about half of what it produced as recently as 2017. In 2014, Venezuela pumped nearly 3 million barrels of oil daily. Globally, S&P downgraded 173 corporate issuers and upgraded 67 in the first quarter, noting the high downgrade ratio in the U.S. and emerging markets. There's more: S&P's net downgrade rate (number of total downgrades minus upgrades) is also at the worst level on an annualized basis since 2016, the agency said in a release. "Many of the global risks seen in 2018 are likely to continue in 2019, including slowing global economic growth, fading fiscal stimulus, moderately elevated interest rates, and persistent equity volatility." European Union leaders agreed to give Britain until Oct. 31 to reach an agreement to leave, 4 months longer than Prime Minister Theresa May requested. What they're saying: European Council President Donald Tusk noted at a press conference, “Until the end of this period, the UK will also have the possibility to ... cancel Brexit altogether." Why it matters to the market: It doesn't. The British pound was almost unchanged yesterday following the decision. Our thought bubble, from Axios chief financial correspondent Felix Salmon: "A catastrophic no-deal Brexit has been averted, certainly for now and probably forever." "Even better: The European Union’s 28 leaders — including both Theresa May and Emmanuel Macron — have managed to come to a unanimous agreement, which is no mean feat." "Even if that agreement just means kicking the can down the road to Oct. 31, Europe has shown an admirable level of unity in the face of Britain’s utter chaos. Whatever happens with Brexit, that ultimately bodes well for the European project." The S&P 500 is 1.4%, or 43 points, away from the all-time high it hit in September thanks in large part to this year's strong first quarter, which was the best 3-month start since 1998, Axios' Courtenay Brown writes. The index has history on its side. Per LPL Research, when the S&P has stayed above its low point in December during the first quarter, it has ended the year higher 34 out of the last 34 times. 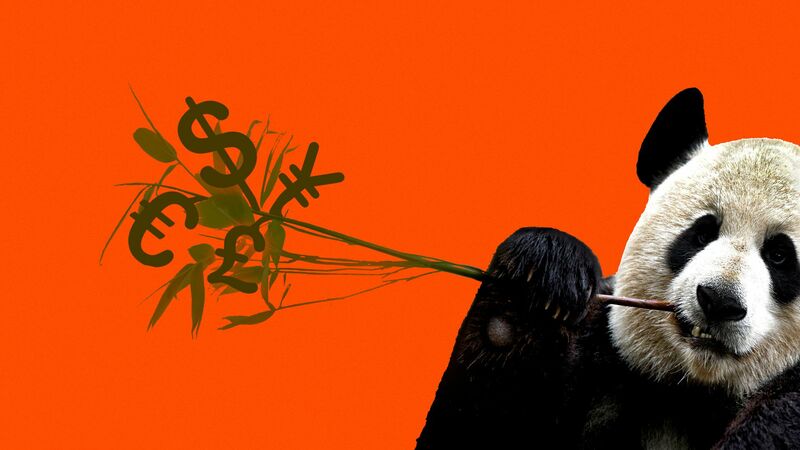 “The market has priced in” some semblance of a U.S.-China trade deal that would ease tariff pain as well as an orderly end to Brexit, Randy Frederick, vice president of trading and derivatives at the Schwab Center for Financial Research, tells Axios. Investors are also optimistic about lower-for-longer interest rates. 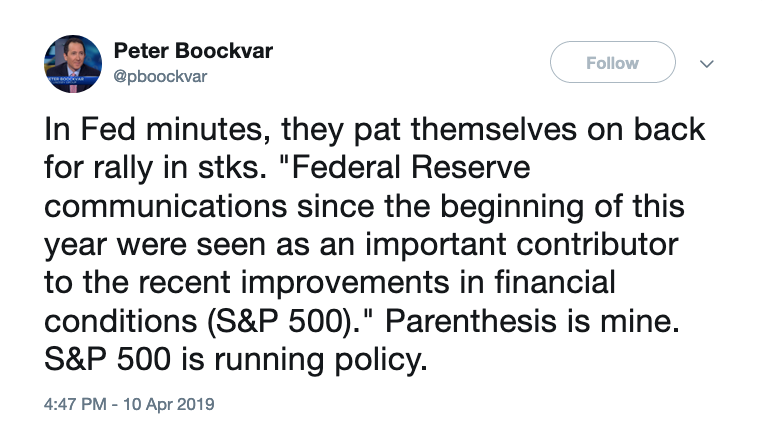 A tweet from Peter Boockvar, chief investment officer of Bleakley Advisory Group. The Federal Reserve released the minutes of its most recent policy meeting Wednesday.